Let the experts at Flatliners Pest Control of Las Vegas provide your home or commercial property with termite treatments, inspection, extermination, and removal. Our technicians are licensed for all termite related pest control whether you are building a new home, selling one, or have noticed any signs of infestation. Give us a call for termite control and we’ll take care of your issue. Because of the damage that termites can do to your property, there are laws and regulations in place for real estate and building construction. A proper soil pre-treatment and termite inspection are required by the Nevada Department of Agriculture on every newly constructed or sale of any dwelling. Flatliners Pest Control is up to date with all state regulations and licensed to perform all termite treatments and inspections. We will make sure that your investment or new home is treated correctly to prevent termites and that your inspection paperwork is done properly. To eliminate any potential concerns during the purchase of a home, having a Termite Inspection is a top priority. Many lenders, loan programs, and investors require a Termite Inspection & Certification before the financing will go through. When it comes to buying or selling real estate in Las Vegas, count on us. Termite Inspections are one of our priorities. With wings, your children may think the termite is a beautiful insect, unfortunately, if these insatiable pests decide your home is their new breeding ground, you can expect costly damage to your property. When a colony has lodged itself into the underbelly of your building, they will never stop consuming the wood inside your home. Swarming termites have a quick rate of production, especially during the spring season when they are searching for a new place for their colony. They can live in and infest almost every area of your home that has wood in it. How To Tell If You Need Termite Control? If you detect termite-sized mud tunnels or blistering damage to the wood in or around your home, you’ve most likely got a termite problem. 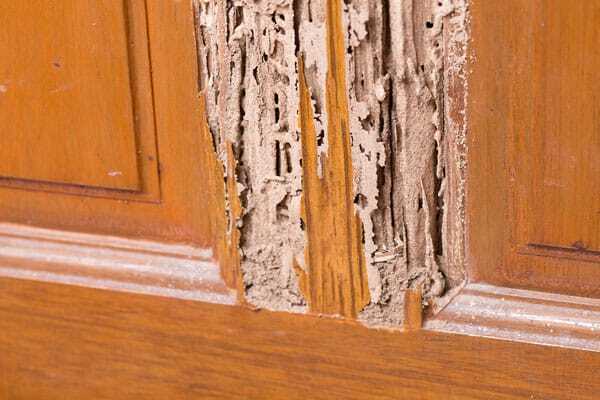 Without a proper inspection, termites can wreak havoc on the interior structure without noticeable problems. It’s important for homeowners and residents to contact a reliable termite specialist before it’s too late. At Flatliners Pest Control we understand the damage termites can cause to your property and your wallet in Las Vegas. Most owners are surprised to discover that termite damage is statistically the biggest cause of property damage, even more so than a fire. Our professional pest management team has the knowledge and tools to make sure your dream home is taken care of properly. We’ll evict and exterminate any termites we find, and prevent them from coming back in the future. Contact us today, so you can rest easy knowing your termite problem is eliminated.